Dayton Progress, Dayton, OH, introduces DaySet high-precision compound tooling—a complete tooling system for the production of high-quality, cost-effective stamped products in a single-step operation. DaySet tooling allows 15-min. tool changeovers, making it ideal for short and medium runs, prototyping and quick-changeover environments. Based on the Hovis Die principle, but with an improved design, DaySet can eliminate the need for high-cost progressive dies for efficient production of stamped parts such as washers, in varying thicknesses, sizes, shapes and materials. 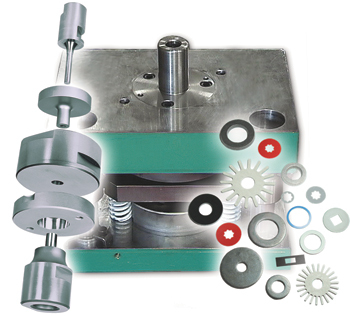 The DaySet preassembled master compound die is a precision-made dieset that works with the compound tooling to provide a complete system for producing flat blanks (like washers) in a single press stroke. This two-post dieset with adjustable guides includes a knockout and key for irregular shapes.